I am a first-time owner of a pistol, a Glock 22. I’m pretty impressed with it, but I was hesitant to buy an expensive handgun safe for it. I have always felt that I don’t need to spend too much for a gun safe. And I’ve also read a lot of stories about electronic gun safes not being the most reliable. Suffice to say, I thought the best gun safe under $500 would suit me well. As a father, I also wanted to keep my weapon from my two sons. An under bed gun safe looked to be ideal for me. The Fort Knox FTK-PB Pistol Box handgun safe proved to have everything I needed from a gun safe—it has a mechanical lock, it is cheap, and it provides decent protection to my gun. This is perhaps the among the best bedside gun safe models today. It fits like a glove to gun owners looking for cheap gun safes but without compromising quality. It’s ideal for first-time gun owners, too, who don’t think they would be getting another weapon or two in the future. Sure, this uses a Simplex-type of combination lock which has been around for many years. It may not be as advanced as other handgun safe models, particularly those that use fingerprint scanning. But that’s actually a benefit to me because I’ve always feared of an electronic gun safe malfunctioning at the most inopportune time. Using this decades-old combination lock also means the Fort Knox gun safe is reliable enough for me. There’s no need to worry about the battery running out of power, electricity goes out, or losing a key. This gun safe is constructed of a rugged 10 gauge body. It has a massive 3/16 inch wrap around door. Because of the thick steel construction, it weighs in at around 22 pounds. Simply put, this one is built like a tank although it’s not too heavy for a bedside gun safe. The solid construction further gives me peace of mind knowing that this gun safe will protect my pistol all the time. The box is resistant to brute force opening. I am sure that burglars will find this safe very difficult to open. 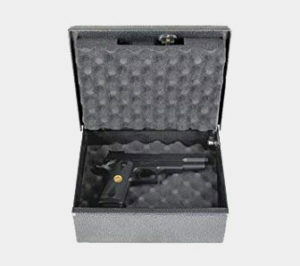 This pistol safe measures 12.5 x 10.2 x 4.5 inches (height, width, and depth). There are two layers of foam inside the safe, both of which can be removed so you can have more space for your essentials if needed. It can fit one or two more pistols plus mags. I can also put some cash, passports, car keys, and documents inside it. I liked that the inside of the safe is padded, giving more protection to my Glock 22. Another feature that I really appreciated is its gas strut. This feature makes the safe easy to use for one-handed operation, which is critical in a self-defense situation. It also supports the lid until you want to close it again. It’s a very nice feature, especially with such a heavy box. I lightly oil the gas strut every now and then to ensure that it works all the time. 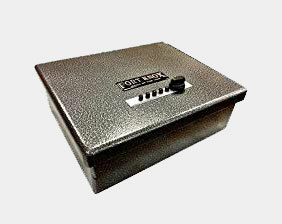 Finally, this small gun safe is anchorable, so it is unlikely to be stolen by the bad guys. There are pre-drilled ports at the bottom of the unit for mounting. The ports are also filled with rubber plugs, which can be removed to show the pre-drilled mounting holes, which can be utilized as drilling template to anchor this gun safe. It is also possible to mount this safe on its side, although I felt that it could void the warranty. I also didn’t want to drill holes on the safe, so I didn’t mount it sideways. What can I do to open the safe in case I forgot the combination? There’s no other key or means to open the safe in case you forgot the combination. If you really can’t remember the right combination, then you would have to contact the manufacturer. How many combinations can you have for this gun safe? There are 1,084 possible combinations that you can make for this gun safe. A thief has to be very patient if he wants to crack the code. It has five buttons, which you can set to any sequence. That is pretty decent for a mechanical lock, although certainly, it doesn’t beat electronic locks in terms of safety. I haven’t had any regrets in buying the Fort Knox FTK. It has basically given me everything that I need from a gun safe. It’s pretty affordable, as I bought one for less than $300. I really can’t say it’s a cheap gun safe because it is solidly built. The 10 gauge steel is a lot better than most standard gun safes in the market, and the fact that I can anchor it pretty much makes this gun safe impossible to steal. 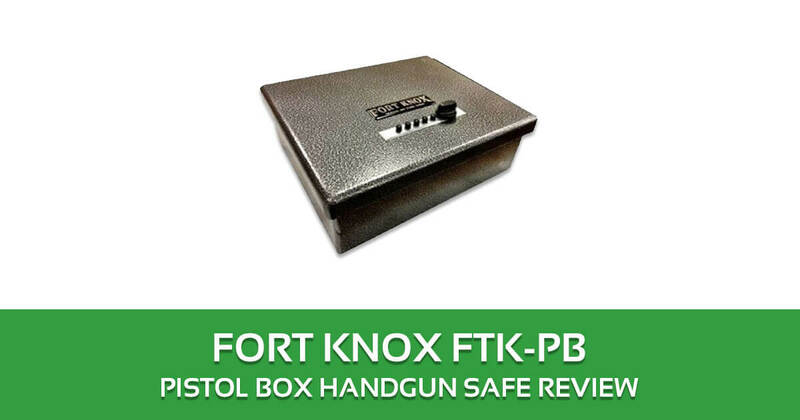 Overall, the Fort Knox FTK is a very good choice for gun owners like me who are hesitant to spend more than $500 on a gun safe. It’s also ideal for first-time gun owners looking for a reliable but small gun safe.